All information added or updated since this page first went up on April 30, 2014 is in GREEN TEXT below. This page provides student flight experiment teams a log of all activities associated with the 16 flight experiments comprising the SSEP Mission 5 Charlie Brown payload (15 Mission 5 experiments and 1 Mission 2 re-flight experiment) from the time the mini-laboratories are received in Houston before the flight of Orb-2 to the point when the mini-labs are shipped back to the flight teams after return to Earth. While this page will feature general progress reports on the status of the SSEP M5 payload, its main purpose is to provide updates to the student flight experiment teams as quickly as possible regarding the handling of their mini-laboratories in orbit, so that they can effectively conduct their ground truth experiments. The teams are advised to bookmark this page and check it for updates during the mission. Astronauts will work with the SSEP payload at times of the day that best fit their overall work schedule. Even though crew interactions with the experiments are to take place on pre-specified Crew Interaction Days, the time of interaction can therefore vary from one Crew Interaction Day to the next. While the SSEP program team may know the astronauts’ planned work schedule a few days in advance, we’ll not know exactly when the payload is handled until the task is complete. After the astronauts have completed handling of the SSEP payload, NanoRacks will forward a report on the activity to the SSEP program team at NCESSE, and we will then post the details – including the time at which the payload was handled – on this SSEP Mission 5 to ISS: Experiment Log page (the page you are reading now) to make the information available to all student teams as quickly as possible. The report will be posted as soon as it is received, but it may take up to 24 hours for the information from the International Space Station to make its way to the Log. That means, for example, that the details for an activity conducted by the astronauts on the afternoon of a specified Crew Interaction Day will be posted on the Experiment Log no later than the afternoon of the following day (and likely far sooner than that). March 21, 2014: Orb-2 launch slips to NET May 6, 2014; Orb-2 launch must follow launch of SpaceX-3; payload contamination found on SpaceX-3 slips launch. April 7, 2014: NCESSE reports that recent delays in the launch of the Atlas mission and SpaceX-3, due to a fire at a critical radar station and SpaceX-3 payload contamination, will likely and significantly impact launch of Orb-2. While NCESSE is required to continue driving SSEP flight operations against a May 6 launch, NCESSE expects that the launch will slip to June. April 14, 2014: Space X-3 launch scrubbed, next SpaceX-3 launch window April 18, 2014; nothing official to announce regarding the impact on Orb-2 launch schedule. April 21, 2014, 12:51 pm ET: all 16 SSEP flight experiment mini-laboratories were reported received by NanoRacks in Houston for payload integration. April 22, 2014, 7:47 am ET: NCESSE reports that although there is nothing official from NASA/NanoRacks at this time, the successful launch and berthing of SpaceX-3 with ISS is reported by Spaceflight Now to delay the launch of Orb-2 to NET June 10, 2014. April 22, 2104, 9:10 pm ET: NCESSE reports that NASA has officially moved Orb-2 launch to NET June 9, 2014. April 25, 2014, 10:04 am ET: NanoRacks reports handover deadline for refreshed/reloaded flight experiments – Friday, May 23, 2014. May 8, 2014, 10:25 am ET: NCESSE reports that the NASA Consolidated Launch Schedule has been updated to indicate Orb-2 launch on NET June 10, 2014 at 2:07 a.m. ET. NCESSE advises that this date is still exceedingly fluid and teams should anticipate further delays. May 30, 2014: NCESSE reports that the NASA Consolidated Launch Schedule has been updated to indicate Orb-2 launch on NET June 16, 2014. However, they cautioned that NanoRacks was reporting NET June 21, 2014 would be announced to de-conflict with RS EVA 38. June 9, 2014: Orbital Sciences reported NET July 1, 2014 for Orb-2 launch. June 12, 2014: NanoRacks reports handover deadline for refreshed/reloaded flight experiments – June 20, 2014. June 20, 2014: NanoRacks reports NET July 5, 2014 for Orb-2 launch, but indicates the anticipated report from NASA/Orbital regarding the investigation into the engine failure is not expected until Monday late afternoon. Orbital has updated its launch schedule for the Orb-2 mission to a date no earlier than July 10, 2014.Orb-2 is the second of eight cargo resupply missions to the International Space Station (ISS) under the company’s Commercial Resupply Services (CRS) contract with NASA. The new launch schedule reflects progress in the investigation into the cause of an AJ26 engine test failure and identification of specific actions to clear the Orb-2 mission for flight. The Antares team will inspect the AJ26 engines installed on the Orb-2 rocket this week, and a decision to proceed toward launch will be based on the results of the inspections. All other elements of the Orb-2 mission are prepared to move forward, including the Cygnus spacecraft, which is fueled and, except for late-load cargo, is packed with its manifest of ISS cargo. June 23, 2014: NanoRacks reports handover deadline for refreshed/reloaded experiments slipped to – July 1, 2014. July 3, 2014: Orbital Sciences and the NASA Consolidated Launch Schedule updated to reflect a formal launch slip to July 11, 2014 at 1:40 pm ET. July 9, 2014, 3:26 pm: Severe thunderstorms at WFF on Tuesday July 8 delayed roll-out of the Antares Rocket. Orb-2 now launching on July 12 at 1:14 pm ET. July 11, 2014, 9:05 am: NCESSE reports that due to continued bad weather, launch is rescheduled to July 13, 12:52 pm ET. July 13, 2014, 12:52 pm ET: Orb-2 launches from the Mid-Atlantic Regional Spaceport (MARS), Pad 0-A, Wallops Island, Virginia. July 16, 2014, 6:39 am ET: expected berthing of Orb-2/Cygnus vehicle at the International Space Station. July 16, 2014, 6:36 am: Cygnus is captured. July 16, 2014, 8:53 am ET: 2 hours after grapple, 2nd stage capture is complete. Cygnus is hard mated to the Harmony Module of the ISS. NRP-10009-2, S/N 1012: Flagstaff, Arizona, How does DNA of onion root cell split in microgravity? NRP-10009-5, S/N 1012: Hillsborough County, Florida, Will microgravity affect the growth/germination of lettuce seeds? NRP-10009-1, S/N 1013: North Attleborough, Massachusetts, If you cut a Dugesia Planarian worm would it grow back in microgravity? 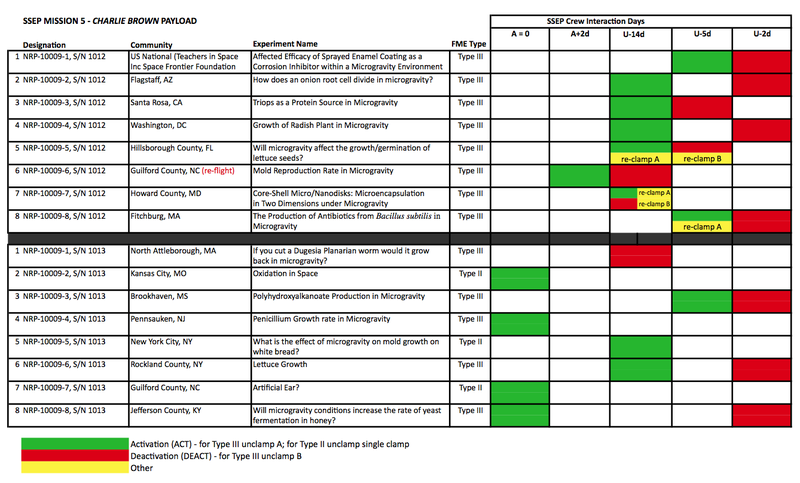 NRP-10009-5, S/N 1013: New York City, New York, What is the effect of microgravity on mold growth on white bread? NRP-10009-7, S/N 1013: Guilford County, North Carolina, Artificial Ear? NRP-10009-8, S/N 1013: Jefferson County, Kentucky, Will microgravity conditions increase the rate of yeast fermentation in honey?